Organically Beautiful: The Best Hangover Cure - For Your Skin! The Best Hangover Cure - For Your Skin! No matter what your hangover cure to make you feel better is, it probably doesn't help the fact that you still look in the mirror and think 'well, look what the cat dragged in'. Assuming of course, that you are not some super alien creature that wakes up hungover and starts the day off looking like a supermodel - if that is the case, I am extremely jealous, and please tell me how you do it! As I was saying, most hangover cures help you feel better, but not many will help you look any more presentable. Enter, BlackBox Cosmetics' Infusion AM. This daily serum is packed with so many anti-oxidants and nutrients, that if your super-fruit smoothie had boots, it would be shaking in them. To start off, the serum is Aloe Vera based, which hydrates your skin. (Learn why Aloe Vera makes such a great ingredient here). Then, BlackBox Cosmetics' packed it with a high content Vitamin C (20% to be exact), and added age defying ingredients which helps reduce puffiness and fine lines while stimulating the production of collagen. But while BlackBox Cosmetics was making this serum, they must have thought 'that's great and all, but we need more!' So they filled it with some of the worlds most powerful anti-oxidants: Green Tea, Gotu-Kola, CoQ10, Milk Thistle, Yeast Beta Glucan, Goji Fruit Extract, Pomegranate, and Acai Berry. Topping off the serum with the light scent of Lime Verbena, a citrus scent which is proven to help wake you up and give you a burst of energy. 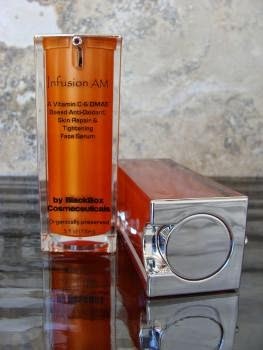 So, if you're looking for the best hangover cure, make sure you include BlackBox Cosmetics' Infusion AM! Infusion AM Ingredients: Aloe barbadensis (Organic Aloe Vera) Juice, Punica Granatum. L. (Organic Pomegranate) Distillate, Pure Vegetable Glycerin, Emulsifying Wax, Rosa mosqueta (Rosehip Seed Oil), Euterpe oleracea (Acai Berry) extract, Lycium Barbarum (Goji) FruitExtract, Morinda citrifolia (Organic Noni) Fruit Extract, Vanccinum angustifoilium (Wild Blueberry) Fruit Extract, Mangosteen(Garcinia Mangostana L.) Fruit Extract, Tocopherol (Vit. E), Butylene Glycol, Hydroxypropyltrimonium (Honeyquat), Ascorbyl Palmitate (Vit. C Ester), Tetrahexyldecyl Ascorbate (Vit. C Ester), Dimethylaminoethanol (DMAE), Limnanthes alba (Meadowfoam) Seed Oil, Phenoxyethanol, Citrus auranium dulcis (Organic Orange) Fruit Extract, Aphanizomenon flos aquae(Bluegreen Algae) Estract, Citrus medica limonum (Organic Lemon) Extract, L-Ascorbic Acid (Vitamin C), Centella asiatica (gotukola), CoQ10 (Coenzyme Q10), Microalgae Nannochloropsis Oculata (Algae Extract), Vaccinium myrtillus (Organic Bilberry)Extract, Beta Carotene (Pro Vit. A), Camellia sinensis (Green Tea EGCG(90%), Silybum marianum L Gaertn (Milk Thistle/Silymarin), Alpha Lipoic Acid/Thioctic Acid, Saccharomyces cerevisiae (Beta 1- 3 Glucan Yeast), Saccharum officinarum (OrganicSugar Cane) Extract, Acer saccharinum (Organic Sugar Maple) Extract, Salix nigra (Willow bark) Extract, d-Calcium Pantothenate (Panthenol Vit. B5), L-Arginine, Niacinamide (Vit. B3), Retinol Palmitate (Vit. A), Nicotinamide Adenine Dinucleotide- NAD (Vit. B3), Olea europaea (Olive Leaf) Extract, Gingko Biloba (Gingko Leaf) Extract, Aspalathus linearis (Rooibos) Extract, Camellia sinensis (White Tea) Extract, Rosmarinus officinalis (Rosemary) Oleoresin, Azadirachta indica (Neem)Oil, Daucus carota (Carrot) Oil, Lecithin, Xanthan Gum (Polysaccharide gum), Tetrasodium EDTA, Citric Acid, essential fragrant oils.